A Spanish study published in The Holocene has concluded that the progressive rise in temperatures since 1890 will lead to the total disappearance of the Pyrenean glaciers by 2050. Glaciers advanced during the Little Ice Age (LIA) between 1300 and 1860 in the Pyrenees, Picos de Europa and Sierra Nevada. These were most extensive in the Pyrenees (because of altitude and latitude) but today glaciers remain only in the highest peaks. 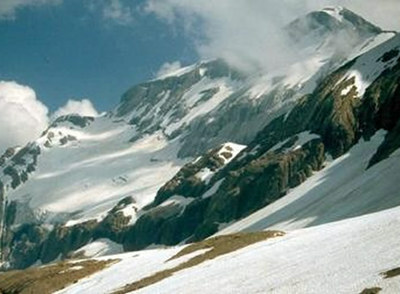 There were six glaciers in the Picos de Europa Massif during the LIA, and one glacier, the southernmost of Europe, in the Sierra Nevada (Pico de Veleta). All of these glaciers have been in continuous retreat since the end of the nineteenth century, 94 have disappeared completely (Veleta in 1913), leaving 29 glaciers in the Pyrenees (10 in Spain, 11 in France), four buried icepatches in the Picos de Europa and one buried icepatch in the Sierra Nevada. The last 15 years has seen a 50-60% reduction in surface area of the largest glaciers. Glaciers in Spain (2004) Spanish glaciers melting fast Greenpeace has released a report on the state of Spain’s glaciers. The glaciers on the Spanish side of the Pyrenees are melting fast.. Total surface area has dropped from 1779 hectares in 1894 to 290 in 2000, representing a fall of 85% in of surface area. 52% of this has occurred in the last 20 years, and 30% between 1991 and 2001.